Ceci n’est pas une pub. This is not a commercial. This qr code links to a recording of a street improvisation by ordinary passers by, facilitated by Akutsk, using the Anthropomorfer. Sound graffiti you may call it, I use the name fonografiti. When using a qr code, we embark on the colonisation of the still rather virginal web based virtual track of the street. Although the medium is sonorous, the access to the location specific electro acoustic collective improvisation necessarily passes through the visual. The qr code must catch your attention before it can work as a key to the virtual audio track of the place. QR codes are in many cases used in commercial contexts, and the first thing we need to do is to decolonise this technology from the logic of the market. I’ve met a good deal of people not aware that you can easily make these codes yourself. Using qr codes is probably the easiest way for anyone to interact (virtually) in the street through sound, – and any other media btw. In order to make sure that people understand that this specific qr code is not a commercial – ceci n’est pas une pub – we must add something, visually, to the code itself. Streetsoundartist Medlyd uses CD boxes on which he paints the QR code. Using a technique that cannot be subject to mass production, Medlyd succeeds in communicating the non-commerciality of the code. And a CD box connotes music. It’s a CD release! 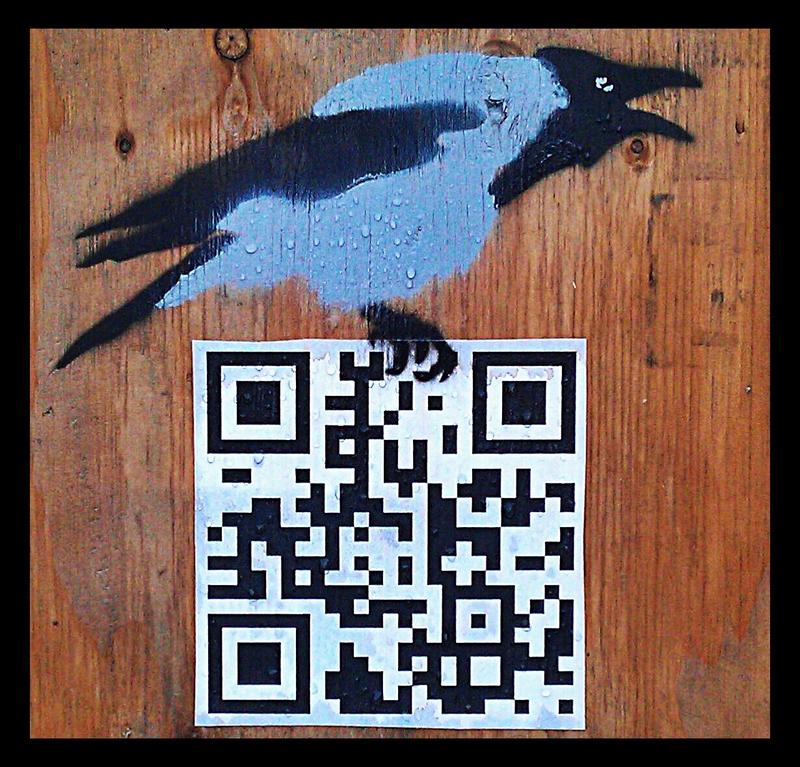 In this photo you see a stencil of a hooded crow on top of a paste up of a QR code measuring 15×15 cm. The obvious handy craft side to the work makes it obvious that this is not commercial, it is ‘street’. Now scan the code! We won’t sell you anything. We want to share a unique piece of sound art improvised on this specific location using only sounds from this place. Ceci n’est pas une pub.